Superb mix of summer squash! One taste of this incredible squash mix and you'll be hooked! 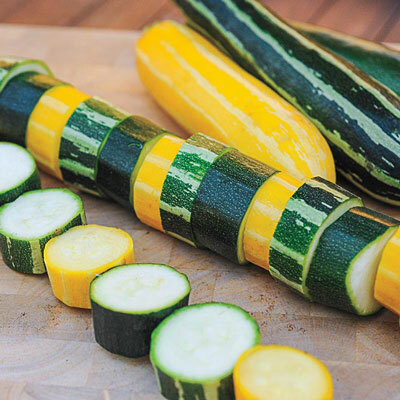 Perfect for grilling, salads or stir-fries, this mix includes gold-striped, dark-green striped, dark green squash and more. Excellent quality for fresh eating, kebobs and more. Hardy and vigorous, compact spineless plants offer very high yields. 50-60 DAYS. Height 6 - 8 inches. Germination Germinates at 68-77F, in 7-10 days. Days To Maturity: 50-60 Days. Fruit: This mix includes the stunning color combination of gold striped with very pale green (white), dark green striped with light green, white, and dark green. Yield: Prolific mix of summer squash.